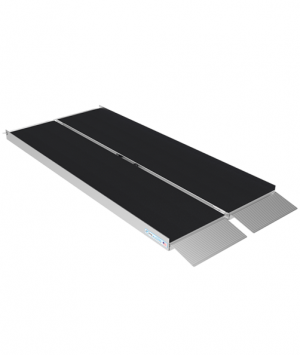 This ultra-lightweight ramp is exceptionally strong, thanks to its unique material composition consisting of glass-reinforced graphite fiber. This ultra-lightweight ramp is exceptionally strong, thanks to its unique material composition consisting of glass-reinforced graphite fiber. 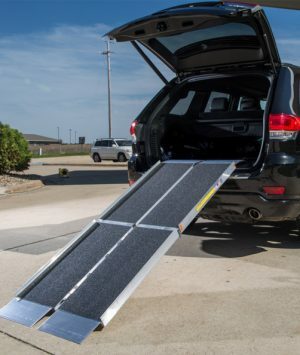 Available in five sizes, the SUITCASE Graphite Fiber ramp features a singlefold design and is the ideal choice for active users and caregivers who want the very best. 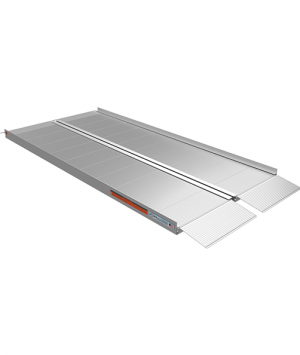 Additional features include a full-length folding joint for additional strength, a slip-resistant coating for excellent traction, and high visibility lines on the outer edges for added safety. Ramp sizes: 29”, 35”, 51”, 67”, and 82”. See SUITCASE GF Size Chart. 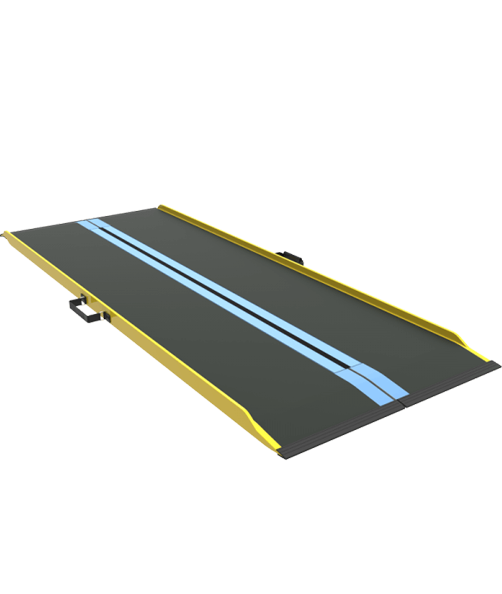 The lightest folding ramp in the industry, the SUITCASE Singlefold GF Ramp utilizes industry-leading technology to provide the ultimate weight capacity at the lightest weight possible. These make your SUITCASE Singlefold Ramp easy to carry, wherever you may go. The flexible, non-breakable handles feature a durable design and a comfortable grip. Mobility devices can retain traction in all weather conditions with the SUITCASE Singlefold GF Ramp’s slip-resistant coating. The SUITCASE Singlefold GF Ramp’s full-length folding joint runs the full length of the ramp for additional strength. 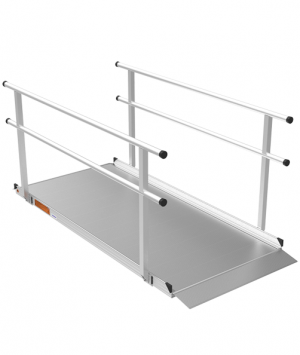 The singlefold folding joint also protects against pinching and ensures the ramp is easy to set up.